Consultations on . . . Preparation of . . .
A valuable guide for clergy and church workers, updated for the 2005 tax year. 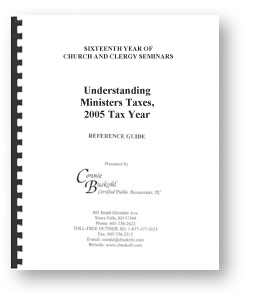 Copies of Understanding Ministers' Taxes, 2005 Tax Year are available by mail for $30 each (includes tax and shipping) from Connie Buskohl, CPA., 401 S. Glendale Ave., Sioux Falls, SD 57104. Checks or money orders only, please. Call toll-free 1-877-477-2623 to find out more, or e-mail us at connie@cbuskohl.com. Confused about housing allowance and the term "fair rental value"? Recent court rulings are currently under appeal by the U.S. Department of Justice on behalf of the IRS. Click here to learn more about the Warren decision. Check out our Chart of Pastor's Compensations for tips on tax preparation. Are you a student or paying for a child's college tuition? View the chart highlighting Tax Benefits for Higher Education. Give us a call with your questions or to schedule an appointment. Connie Buskohl CPA also offers on-site Church & Clergy Tax Seminars for groups of 20 or more. Call toll-free 1-877-477-2623 for more information.